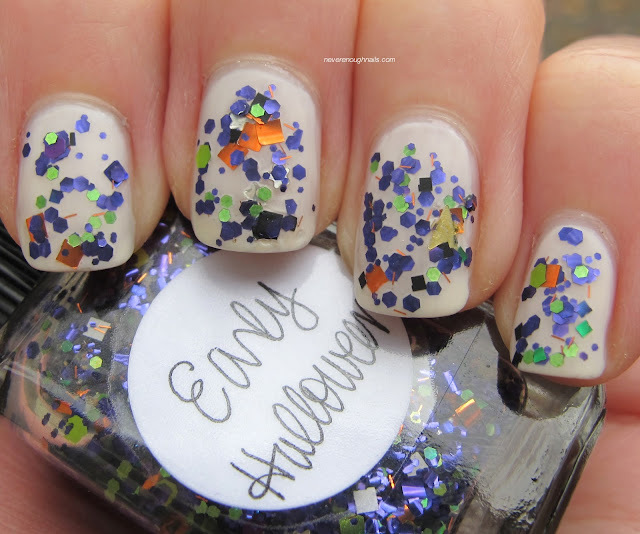 I think Lynnderella Cauldron Drippings has officially been replaced as my favorite Halloween polish. There's a new star in town, specifically Lynnderella Early Halloween. 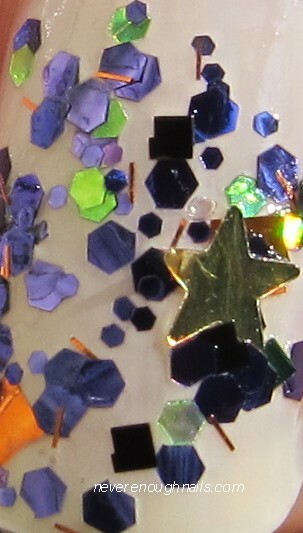 This mix of violet, orange, and green glitters with random fun pieces like holo diamonds, gold stars and teeny silver stars is one of the coolest polishes I own. I tend to get super excited over Halloween polish and Early Halloween manages to feel very Halloween-y, but I could also wear it year round (which I will do). I really love the particular shades of purple, orange, and green that Lynn used in this polish. They look so awesome together! Lynn had noted that Early Halloween might have a challenging application, but I didn't experience anything terribly difficult. This is two dabbed coats over two coats of Nicole by OPI Others Pale By Kim-parison. Having read her note about the application, I decided to dab right off the bat and it worked very well. I did find one huge orange square that was all curled. I wiped it off on a tissue because I knew it would never lie flat. None of the other glitters were curled though, so maybe it was just a weirdo. I wore this for three days and then decided to see what it looked like with a matte top coat. I LOVED it matte! It looks even spookier! Below you can see it with one coat of KnockOut Cosmetics Flatte Top. What are your Caturday plans? Mine are: get ready for the Snowicane heading my way, and watch the Halloweentown movies on Disney!! Speaking of the Snowicane/Frankenstorm, if by any chance you don't hear from me on Monday or Tuesday, it's possible that I've lost power and can't blog. My neighborhood rarely loses power, so I'm hopeful we'll be fine! Lynnderella Early Halloween is available on her eBay store. Nicole by OPI Others Pale By Kim-parison was sent for review. For more information, please see my Disclosure Policy.